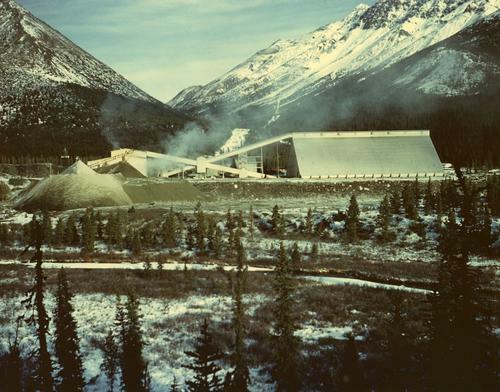 Photograph depicts large dry rock storage building in foreground on right, mill on left behind tailings pile, and dryer building in centre behind conveyor belt connecting mill to dry rock storage. A cloud can be seen rising from plantsite. Trees and Troutline Creek cross foreground, mine valley and mountains visible in background. Stamped annotation on recto of photograph: "ANSCO PRINTON Munshaw Colour Service Ltd. MAR 10 1955". Item is part of the Cassiar Asbestos Corporation Ltd. fonds. See also items 2000.1.1.3.18.2 and 2000.1.1.3.18.3 for images featuring similar content. Original accession no. : 2000.1.0254.017 [this photograph came from box 254].